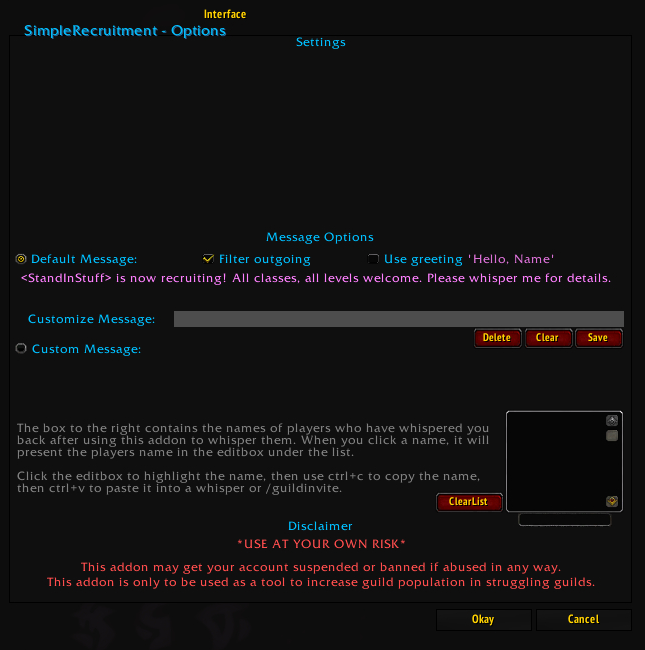 Simple recruitment is a guild recruitment (whisper ONLY) tool created by request. Built-in 30 day blacklist that syncs across guild officers. Syncs on log-in and when the addon is used. 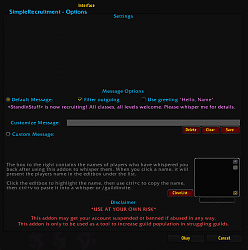 Default message using current guild name. Ability to include a personalized greeting "Hello, 'Name'" prior to recruitment message. Filter outgoing messages if you so desire. Class filter for /who information. Pop-up window for easily copying the names of characters who respond. Re: I need this, but more. Well, I figured out from the LUA text that /sr scan will initiate the messaging. Unfortunately, the sent message does not display, nor do those that reply appear in the listbox. There appears to be something there, but clicking in the listbox gives an error. I'm not going to risk blasting the same people trying to test this. Perhaps a debug option that will output all message operations to local? Last edited by Malokai : 04-14-19 at 01:35 PM. I need this, but more. This biggest issue with SimpleRecruitment is that I have no idea if it is working or not? I see no messages going out. Is there a tutorial? What does "Filter Outgoing" do? - Blacklist listing - Who is in my list? - Built-in /who window showing unguilded players who are not in Blacklist. Instead of tracking respondents, perhaps track who you sent to. Button for "Thank you" message if person declines. In the end, no Automated function, but a manual interface that would ease the effort of tracking recruitment efforts. Updated to a BETA version with all current options available. Will now function as intended, baring errors. This addon is currently in an alpha state for testing, and is hard-coded in a debug state. Last edited by Kaemin001 : 08-25-18 at 03:55 PM.